Karan Soni (born January 8, 1989) is an Indian-American actor. He rose to international prominence for playing Dopinder in the 2016 film Deadpool and its 2018 sequel, Deadpool 2. Soni is from New Delhi, India, where he attended an international school. He came to the United States to study at the University of Southern California. Soni made his film debut in Yusuf Sumer's 2010 comedy film Kaka Nirvana, alongside Rachel Quinn. In 2013, Soni was cast in the Amazon Studios original series Betas. The series was cancelled after one season. In 2014, Soni appeared in commercials for AT&T. In 2015, Soni appeared in Other Space, a series created by Paul Feig, as Captain Stewart Lipinski. The series was also cancelled after one season. That same year he appeared in episodes of Melissa & Joey, The Goldbergs, and 100 Things to Do Before High School, and began starring in Blunt Talk, opposite Patrick Stewart, as Martin. The series was renewed for a second season, which premiered in 2016, but on December 20, was cancelled after two seasons. In 2016, Soni appeared in Deadpool as a taxi driver named Dopinder and in Ghostbusters as a delivery man named Benny. 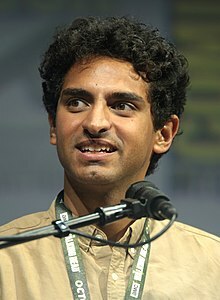 He played Dopinder in 2018's Deadpool 2. 2011 The Protector Kenny Episode: "Safe"
2012 Touch Ravi Episode: "1+1=3"
Linked Out Keith Episode: "Facebook Intervention"
1600 Penn Misfit Episode: "Putting Out Fires"
Bite Me Teacher's Assistant Episode: "Continue!" Are You There, Chelsea? Stan Episode: "Sloane's Ex"
2013 Little Horribles Unknown Episode: "Road Rage"
Trophy Wife Graduate #2 Episode: "Pilot"
The Middle Vijal Episode: "Life Skills"
2014 Growing Up Fisher Owen Episode: "Secret Lives of Fishers"
2015 Melissa & Joey Flash Episode: "Failure to Communicate"
100 Things to Do Before High School Caltech Dude Episode: "Be a Mad Scientist Thing!" The Goldbergs Randy Mescunda Episode: "Boy Barry"
Silicon Valley Tenley Episode: "Hooli-Con"
Room 104 Anish Episode: "The Internet"
2019 Brooklyn Nine-Nine Gordon Lundt Episode: "The Honeypot"
^ Jha, Neha (2016-02-22). "Meet Deadpool's Dopinder: Indian-American Karan Soni shares his experience". Deccan Chronicle. Retrieved 2019-02-14. ^ Andreeva, Nellie (October 18, 2013). "Amazon Studios Comedy Pilot 'Betas' Assembles Cast". Deadline.com. Retrieved February 14, 2016. ^ Kimball, Trevor (April 3, 2014). "Betas: Amazon Series Cancelled, No Season Two". TVSeriesFinale.com. Retrieved February 14, 2016. ^ Ramachandran, Vignesh (April 21, 2015). "KARAN SONI, THAT GUY FROM THE AT&T COMMERCIALS TAKES THE SILVER SCREEN". Ozy.com. Retrieved February 14, 2016. ^ Rohwedder, Kristie (February 13, 2015). "Who Are The Actors Who Play The Network Experts In the AT&T Commercials? These Guys Are Good". Bustle.com. Retrieved February 14, 2016. ^ Donnelly, Matt (April 15, 2015). "Why Paul Feig Chose Streaming for His New Comedy 'Other Space'". TheWrap.com. Retrieved February 14, 2016. ^ Brouwer, Bree. "Yahoo Lost $42 Million On 'Community' and Two Other Originals". TubeFilter. Retrieved February 14, 2016. ^ "JOEY LAWRENCE, KARAN SONI, MELISSA JOAN HART". TeenInfonet.com. February 3, 2015. Retrieved February 14, 2016. ^ "Scoop: THE GOLDBERGS on ABC - Tonight, October 21, 2015". BroadwayWorld.com. October 21, 2015. Retrieved February 14, 2016. ^ "Mad Scientists - "100 Things to Do Before High School"". Nickalive.blogspot.com. November 21, 2015. Retrieved February 14, 2016. ^ Wariach, Sonia (November 9, 2015). "Catch Karan Soni's Blink-and-Miss Role as Mr. Rooney in 'Goosebumps'". Indiawest.com. Retrieved February 14, 2016. ^ Baron, Steve (February 24, 2015). "Starz Announces Recurring and Guest Cast for 'Blunt Talk' Starring Patrick Stewart". TVByTheNumbers.zap2it.com. Retrieved February 14, 2016. ^ Goldberg, Lesley (29 April 2014). "Starz Orders Two Seasons of Seth MacFarlane Comedy 'Blunt Talk'". Retrieved February 14, 2016. ^ "EXCLUSIVE: Karan Soni Talks Deadpool, Improvising with Ryan Reynolds". ComicBook.com. October 30, 2015. Retrieved February 14, 2016. This page was last edited on 20 April 2019, at 00:42 (UTC).